Two Cardigans, two tones - our classic 3-button cardigan in strong fall colors, and our modern, single button style in sherberts. Both are made from our 100% Baby Alpaca - ultra-soft, ultra-luxurious. Lightweight, yet warm, these cardigans are great toppers for pants, tights, or onesies. 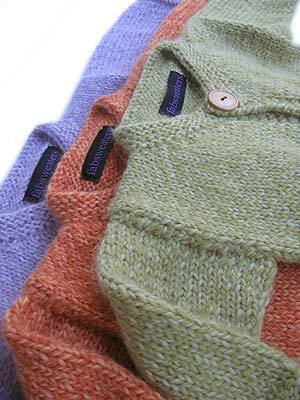 Add a little style to that bundle of joy - with a fab cardigan to chase away the chill!